Special offer: NAUTILUS HALF RACK WITH NEW BASE PLATE - directly from the manufacturer! Special offer: NAUTILUS GLUTE DRIVE - directly from the manufacturer! Nautilus Inspiration® Series - SPECIAL EDITION - directly from the manufacturer! 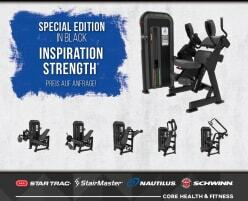 Nautilus Free Weights Package - Only while stocks last! Nautilus Leverage - DIRECTLY FROM THE MANUFACTURER! 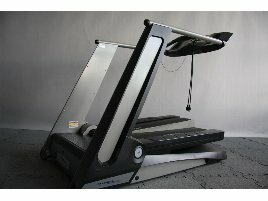 10 x Nautilus Treadclimber TC916 - Treadmill Transport possible! 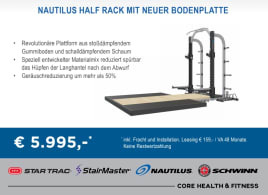 Nautilus which is a brand of the company StairMaster, has been producing fitness equipment for more than 40 years and is specialized on the production of strength training machines. Nautilus fitness equipment are constructed to imitate human movements perfectly and to allow a unique and efficient training experience. The brand is specialized on fitness equipment for strength and cardio training and offers a wide range of training machines. 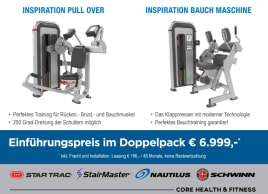 The large number of different new and used Nautilus fitness equipment can also be seen on fitnessmarkt.com where new and used Nautilus fitness equipment can be found in nearly every category of strength and cardio training equipment. Not only private persons, but also owner of gyms, sport centers or hotels with fitness area offer their new or used fitness products here. 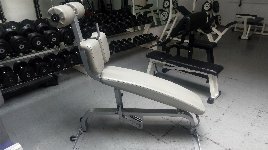 fitnessmarkt.com offers the right marketplace for your new and used Nautilus fitness equipment. 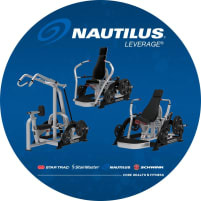 Not only fitness enthusiasts, but also professional athletes, owners of gyms and retailers are looking here for new and used Nautilus fitness equipment. 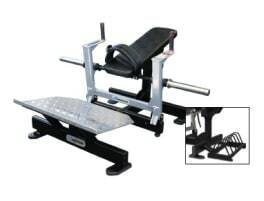 As it is easy and comfortable to contact the seller directly using the contact form or stated information, many vendors are using fitnessmarkt.com to sell their new or used Nautilus fitness articles. Of course you can also book a highlight ad which emphasizes your ad in color and sets it at the top of the list of results in the chosen category. 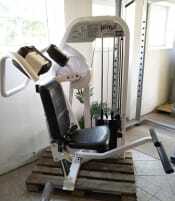 In this way you reach even more potential customers for your new or used Nautilus fitness equipment. We wish you success in selling your Nautilus fitness equipment or in looking for a suitable new or used product!